8:30am to 5:30pm (EST), Monday - Friday. Saturday 9:00 am- Noon. 8:00am to 5:30pm (EST), Monday – Thursday, Friday 8:00am to 5:00 pm. Seasonal hours on Saturday’s (January –Labour Day). 9:00 am to Noon. We are closed on Sundays and all Canadian major holidays. 8:00am to 5:30pm (EST), Monday – Thursday, Friday 8:00 am to 5:00 pm. Disclaimer: Not responsible for errors or incorrect information in this publication. PRICING: All prices are subject to change without notice. TERMS: All orders are shipped C.O.D., certified check or prepaid. All goods remain the sole property of Bicknell Racing Products unless paid in full. BACK ORDERS: Any item not available at the time of order will be placed on back order unless other arrangements are made. Item(s) will remain on back order unless cancelled and will be shipped upon receipt. RETURNED CHECKS: If, at anytime a check is returned as “NON-PAYABLE DUE TO INSUFFICIENT FUNDS” the account will revert to a CASH ONLY status. ALL RETURNED CHECKS ARE SUBJECT TO A $25.00 handling fee. 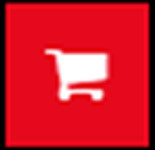 Sales Tax: All applicable taxes (if any) will be added to the purchase price. Ordering: Please use part number(s) when ordering. We will not be responsible for errors in parts ordered by description. Special Order: All items not listed in the catalogue are considered to be “Special Order” and are non-returnable. A signed special order sheet must accompany all orders for custom-built parts or merchandise (rear-ends, race suits, etc.). No returns will be accepted on special orders and custom-built items. SHIPPING: BRP will ship all merchandise by the fastest, most economical method. Our standard delivery is UPS Ground. Next day or two delivery are available for rush orders on customer request. We ship daily Monday-Friday via UPS, FEDEX, Purolator and common carrier. All freight charges apply, insurance, C.O.D. fees per item, handling charges on over –sized items.BRP cannot be responsible for damages due to carriers’ negligence. Any discrepancies in BRP Products order processing or shipment, such as quantity of parts invoiced versus actual parts delivered, must be reported within 3 (three) business days of receipt by customer in order to make a legitimate claim of error. We regret that we cannot ship to Post Office Boxes unless prepaid. ANY DAMAGE CLAIMS MUST BE REPORTED IMMEDIATELY TO THE FREIGHT CARRIER. HOLD ORIGINAL CARTONS, PACKING MATERIALS, DAMAGED MERCHANDISE FOR INSPECTION BY THE FREIGHT CARRIER IF NOT, NO DAMAGE CLAIMS WILL BE HONORED. DROPSHIPS: Any and all items drop- shipped from a vendor are subject to vendor drop-ship charges plus applicable freight charges. RETURNS: NO RETURNS WILL BE ACCEPTED WITHOUT PRIOR APPROVAL. (1) Contact your BRP sales representative and request an RGA (Returned Goods Authorization) number. (2) Provide your BRP sales representative with full and proper information regarding the details of the merchandise to be returned, such as reason(s) why, date of purchase, invoice number. (4) Any electrical items that have been removed from the original packaging will not be allowed to be returned. (5) Merchandise must be in the original condition including all components and cannot be disassembled or damaged due to incorrect installation. Returns missing components will not be credited. It is your responsibility to return any part in resalable condition. Any items deemed non-returnable will be returned to the customer plus freight charges. (6) All merchandise must be properly repackaged in order to ensure safe shipment and delivery of the merchandise to BRP Products. All returns must be shipped prepaid and should be insured. Freight charges are the responsibility of the customer. (5) NO RETURNS will be accepted for custom parts, special orders, close-outs, and non-stock items. (6)No returns on Tires –no returns on wheels. All sales are final. (7) No returns after 30 days. (8) All returns will be subject to a 20% restocking charge. 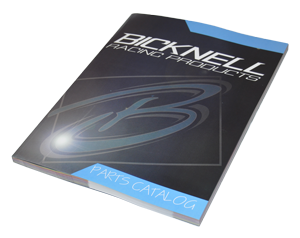 Purchasers understand and recognize that all parts, inventory and services produced or sold by BICKNELL RACING PRODUCTS are exposed to many and varied conditions due to the manner in which they are installed and used. Purchasers expressly acknowledge, understand that BICKNELL RACING PRODUCTS does not make an affirmation of fact or promise to the purchaser which relates to said parts, inventory, or services that becomes part of the basis of bargain with purchasers any description or affirmation of fact concerning any sample of parts, equipment, inventory, or services. As further consideration for purchasers using BICKNELL RACING PRODUCTS parts and equipment any and all inventory and services, purchasers acknowledge that due to differing conditions and conditions under which all parts and equipment are installed and used, purchasers are not relying on BICKNELL RACING PRODUCTS skill or their judgement to select or furnish the proper part or equipment. Purchasers expressly affirm that they are relying upon their own skill or judgement to select and purchase suitable goods. BICKNELL RACING PRODUCTS makes no warranties whatsoever, expressed or implied, oral or written, to purchasers, there is no warranty of merchantability made to purchasers. BICKNELL RACING PRODUCTS further excludes any implied warranty of fitness with respect to all parts and equipment and all inventory and services. It is expressly understood and agreed between the purchasers and BICKNELL RACING PRODUCTS that as part of the bargain between BICKNELL RACING PRODUCTS and purchasers, and in consideration of doing business with each other, all purchasers take, select, and purchase said parts and equipment, any and all inventory and services from BICKNELL RACING PRODUCTS “as is” with “all faults”, and BICKNELL RACING PRODUCTS shall always supply purchasers with full and complete opportunity to examine at purchasers leisure and convenience any part and equipment, and all inventory, of services, when purchasers consider buying from BICKNELL RACING PRODUCTS. If, and in the event that purchasers expressly or impliedly cause representations, or statements, or affirmation of fact contrary to this disclaimer of all warranties, expressed or implied that buyers agree to indemnify and hold BICKNELL RACING PRODUCTS harmless in the event of any claim, demand or legal action against them. Purchasers understand and agree that no officer, director, employee or salesman of BICKNELL RACING PRODUCTS or any of its vendors, dealers, or distributors has any authority to make any statements contrary to the terms of this agreement. On the contrary to what is herein written above.